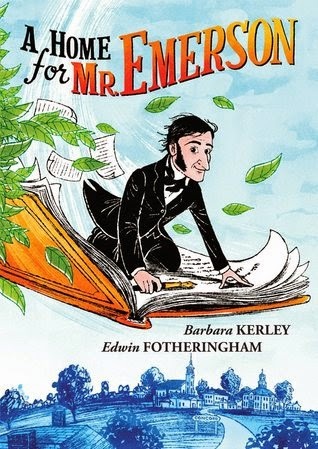 The picture book biography duo of Barbara Kerley and Edwin Fotheringham are back! Kerley and Fotheringham are known for introducing young readers to interesting Americans from the past in What to Do About Alice?, The Extraordinary Mark Twain, and Those Rebels, John & Tom. In A Home for Mr. Emerson, young readers will learn about the life of writer, Ralph Waldo Emerson. I think it's safe to say that the K-5 crowd does not know much about Emerson or his work. Kerley eloquently weaves the theme of home throughout the narrative. Even as a child living in Boston, Emerson longed to live in the peaceful town of Concord, Massachusetts. As Emerson and his wife make a home for themselves in Concord, he fills journals with thoughts and reflections inspired by the nature around him. Quotes from Emerson are effectively incorporated into the story. Fotheringham's bold illustrations depict larger than life books and an oversized Emerson walking across a map of the U.S. showing Emerson on his lecture circuit. Bold colors along with digital, patterned backgrounds make the artwork stand out. Be sure to read the rich back matter. In addition to an author's note and list of quotation sources, readers are provided with a page of activities called "Build a World of Your Own." 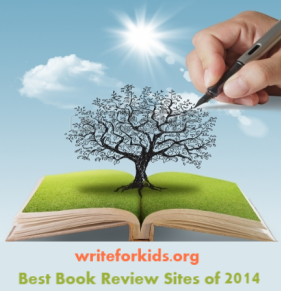 The author instructs children to think about words to describe themselves, favorite subjects, and favorite places as they create their own ideal world. A Home for Mr. Emerson will inspire children to pick up a journal, go outside, look around and write. Pair this book with A River of Words: The Story of William Carlos Williams by Jen Bryant and Melissa Sweet.